Ruido is soon performing at Smiths Alternative. Tickets are super cheap at only $10 this is to encourage lots of the local dancers to join in and make it a gusty brazen gypsy experience. On the quiet, the chics are going to be doing a world premiere their own all-chicas set. Las Amigas of Ruido (April, Sam, Jane, Robyn and Marisol) will be singing, playing, drumming and dancing a short set on their own including the rare and haunting Pearls which was a big success at Illawarra Folk Festival when it was presented for a song competition. RUIDO creates contemporary flamenco with a unique twist: these musicians dance, and the dancers sing and play in an explosion of colour, movement and passion! 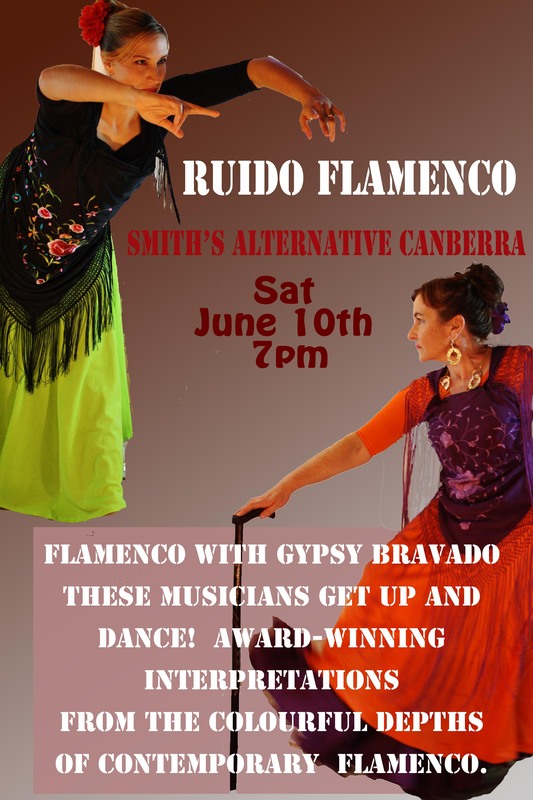 Thrill to gypsy ballads, lively original tunes and award-winning interpretations of the elusive and magical world of flamenco.